The ANDRITZ Gouda paddle dryer / cooler, a machine with a lot to offer, to most materials. Dried or cooled? 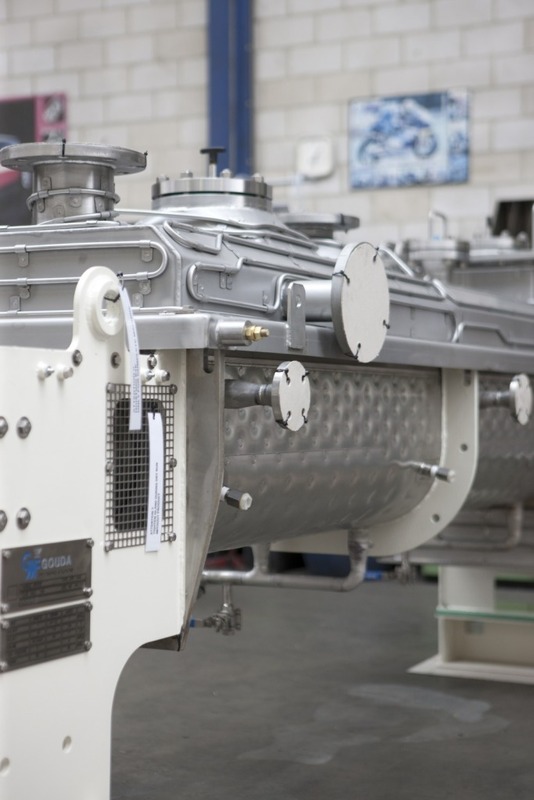 The continuous indirect heat transfer set-up within the paddle dryer's interior produces quality product with incredible efficiency and a minimum of maintenance. Powdered, granulated or pasty materials? The paddle dryer is built to handle products with the utmost care - even toxic materials. ANDRITZ Gouda’s paddle dryer is used for a wide variety of applications. The machine has a heated trough, containing rotating heated paddle shafts. The specially shaped paddles do not have a transport function but are designed for maximum heat transfer. This results in an excellent control of the temperature of the product and enables a uniform product quality. At the outlet side, the product moves out of the machine via an adjustable overflow.